First book in the series about twelve year old Bex and her struggle to fit in a difficult situation. 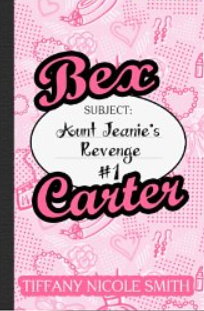 Not only is Beth having the usual coming of age issues with school and peers, but she is living with Aunt Jeanie and her family because Bex’s mother disappeared long ago and her father is in prison. While her aunt is obsessively concerned with “fitting in with society,” Bex enjoys sports and really wishes to be left alone. Things get tough for Bex when she is forced to audition for the “Silver Rose” group. Bex hates the idea, but she really needs to have her own space, the bribe her aunt holds in front of her. Much of the story involves the adventures and pranks that Bex must endure, and her struggle to walk the line between what is truly right and wrong. Middle school and young teen readers will be sure to find many situations that parallel their own at home and school. Throughout the tale, many of the characters grow and change. The book is both serious and humorous with a good mix of the traditional and modern. This book will appeal to readers nine and older. There is just the right mix of dialogue, shift from first person to third person narrative is well done. Can’t wait to see what happens in Bex’s next adventure. Sounds like a fun read! Thanks so much for linking this up at Booknificent Thursday this week!